Black and white photograph showing the member of the Whitby Mall Florist minor hockey team. The team is posing with trophies. Back row: Ben LaHaye (coach), John Allen, Joe McCullough, Gary Roberts, Dave Donaldson, unknown, unknown, Bill Callen, Gord Van Kessel, unknown. Fron row: John Phillips, Steve Gibson, Dave Westcott, Joe Nieuwendyk, Dave Sachco, Paul Guest, unknown. 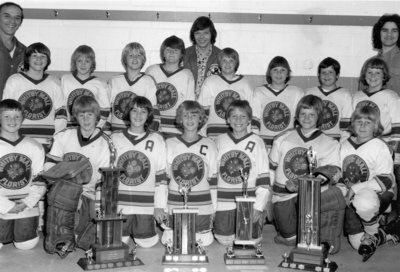 Whitby Mall Florist Minor Hockey Team, c.1980, unknown photographer, Whitby Archives, 21-005-046.